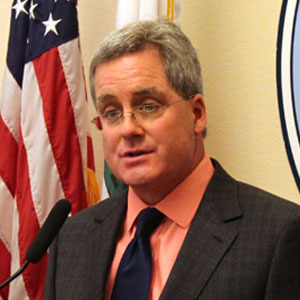 San Francisco City Attorney Dennis Herrera at a Nov. 3, 2016 press conference announcing his lawsuit against the developers of the Millennium Tower. SAN FRANCISCO (Nov. 3, 2016)—City Attorney Dennis Herrera today filed a lawsuit against the developer of the high-rise, residential Millennium Tower, alleging that the developer knew the 58-story building was sinking further and faster than expected but did not disclose that information to potential home buyers as required by law. a year later, by February 2009, the Tower had settled 8.3 inches, more than 2 inches over the maximum amount previously predicted. After May 2009, the developer had data showing that the tower’s settlement was continuing to increase and that is was settling at different rates in different parts of the property, which could lead to the building tilting. None of this information was disclosed to potential homebuyers as required by law, according to 1,900 pages of records that Mission Street Development LLC turned over in response to a subpoena my office issued in September. These disclosure documents discussed everything from the color and veining of marble to noting that the size and types of plants in the common areas of the building could change. But they left out one very important detail. Nowhere that the city is aware of did Mission Street Development LLC disclose the building had settled much more, and much faster, than it was designed to do. News accounts revealed in August that the luxury highrise at 301 Mission Street—which opened to occupants just seven years ago—has already sunk 16 inches and now leans by two inches at its base. According to an engineer hired by Millennium homeowners, the tower is continuing to settle at a rate of about one inch per year—and will likely continue sinking up to 15 inches further into landfill. The City Attorneys’ office is bringing this lawsuit in the form of a cross-complaint against Mission Street Development LLC. It was filed today in the case where a number of Millennium homeowners have sued the Transbay Joint Powers Authority and it members, including the City and County of San Francisco. The authority is building a transit center next to the Millennium Tower site. San Francisco is one of the members of the authority, but the authority is a separate legal entity. In the cross-complaint, the city is seeking damages from the developer as the court deems appropriate. The case is: Laura S Lehman vs. Transbay Joint Powers Authority et al, San Francisco Superior Court, case number CGC-16-553758, filed on Aug. 17, 2016. Additional documentation from the case is available on the City Attorney’s website at: https://www.sfcityattorney.org. Herrera says state bail schedule is unconstitutional, announces he won’t defend it in lawsuit.